Brian the Piranha loves bananas. He tries to convince his friends to try some fruits and vegetables, but they prefer chomping on people’s feet, knees and bums! He keeps asking them until they finally give in and try a fruit platter. Will his friends like it and switch to eating more fruits and veggies? 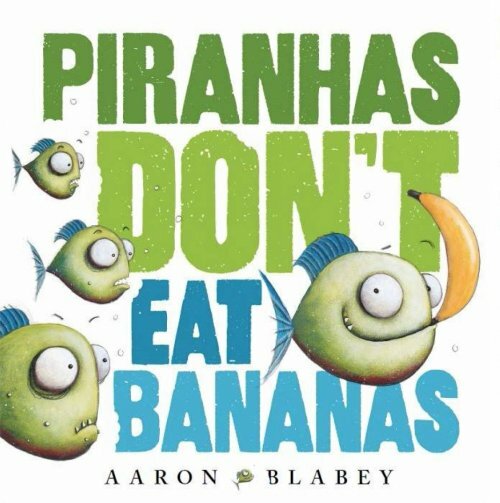 Piranhas Don’t Eat Bananas is a fun and cheeky rhyming book which encourages children to try new things and embrace their individuality. This book has a bit of a Dr Seuss ‘Green Eggs and Ham’ vibe with a ‘try it before you say you don’t like it’ message and could be used with picky eaters. The language in this story is quite simple, but the illustrations can be used to target a range of semantic goals - such as talking about the similarities and differences between the different piranhas. There are also opportunities for children to draw inferences on what the piranhas might be thinking based on their expressions. What I particularly love about this book, is the definitions of the words ‘piranha’ and ‘banana’ included on the end pages. This is a great reference for children who are working on their ability to define words. Lastly, the simple and repetitive text makes this a great choice for children working on their story innovation skills. Once children are familiar with the book, they can retell the story but substitute their retells with new characters or different food groups. For further possible speech and language targets, see the list below.